"The Story of a Heartbeat"
Told in an epistolary style, Akačehennyi on a Diet of Dreams follows Salus, an ambitious woman who dreams of political achievement. She has moved from her home region to the capital to work for one of the founders of the Progressive Movement, a party known for its controversial attitudes about technology and interstellar travel. Her chance for recognition comes one evening on the snaking skyrail train: an assassination, planned but not executed. Blowing the conspirators’ cover could give her everything. Akačehennyi on a Diet of Dreams has not been tagged yet. 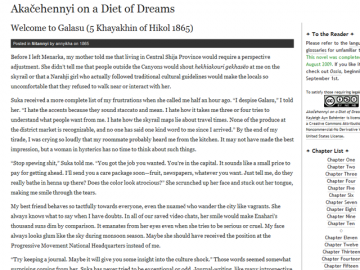 Help others find Akačehennyi on a Diet of Dreams by tagging it! This is an unusual story which seems to straddle genres. It has the advanced technology reminiscent of futuristic sci-fi novels, it has immortal (or long-living?) beings who share collective memories, it has a tinge of romance and relationships, but ultimately it is a thriller, a story of political intrigue. Akačehennyi on a Diet of Dreams has not been recommended yet.